This entry was posted in Training & education on 2019/02/08 by Susan. A high turnover rate means today’s kitchens are seeing more new workers. One executive chef says training and coaching are key ingredients for their safety. Here in B.C. — and across Canada — the restaurant industry is dealing with an ongoing labour shortage. It’s a challenge to fill kitchen positions and there’s a lot of turnover. And, of course, all these new workers need safety training before they start. 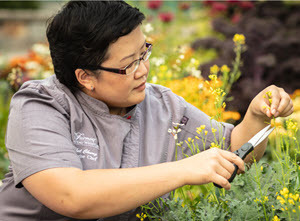 Isabel Chung, executive chef at Fairmont Chateau Whistler (FCW), says her industry is seeing a new generation of workers with less experience. More than 60 percent of injury claims in B.C.’s food service industry involve kitchen staff. They work with tools and equipment that can put them at risk of injury if used improperly. FCW has a strict policy to ensure that new workers are “100 percent familiar” with any kitchen tools they use, Isabel says. At FCW, a kitchen safety trainer or coach teaches new workers to use equipment like meat slicers, grinders, and band saws. Within their first two days, colleagues-in-training meet with the department’s health and safety representative to make sure they’ve covered everything on their safety training checklist. All this training is especially important since working in a hotel kitchen is different than other kitchens. For more kitchen safety information, see Injury prevention: pub and restaurant safety from go2HR. Also visit WorkSafeBC’s Food & beverage services page.